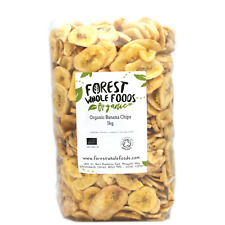 SweetGourmet Imported Sweetened Banana Chips (Dried Fruit) -1LB FREE SHIPPING! Thailand's first and most innovative dried banana production. In place of the traditional sun-drying method, we perform the process in a glass parabolic dome designed by Thai scientists That is why our dried bananas are clean, uniquely delicious, and comply with the international sanitary regulations. "Made from 100% natural premium selected BANANAS fresh from our orchard. Giving you the ultimate tropical Thai fruit experience with every bite. With this snack you can eat healthy, experience great taste, wherever and whenever you want. Ingredients BANANAS 100%, no addectives , wieght 85g. These sweet and tasty banana chips have been fried and sweetened with sugar. A great natural confectionery - but also amazing with nuts, ice cream, brownies, coconut, other dried fruits and of course - dipped in homemade chocolate! 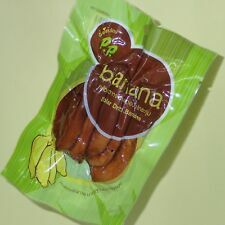 $Solar Dried Banana Sweet Fruit Snack Food 100% Natural & Delicious Condition : NEW WEIGHT : 85 g QUANTITY : 1 PC. No Preservation Added Natural Sweet Taste Processed clean and modern GMP and standards under control. 100% Guarantee-- Good Quality Product --Good Taste Halal--- Vegan Free tracking number for purchase 18 usd. Organically grown in Philippines. Certified organic by the Soil Association. These crisp, golden banana slices are lightly coated in organic coconut oil and cane sugar to give them a delicate sweetness that is perfect for baking or snacking. If you want to try other organic dried fruit take a look at our organic dried apricots, organic deglet nour dates, organic cranberries, organic mulberries or organic sour cherries. Banana powder is the ultimate get out-of-jail-free card. Ever find yourself out of bananas, or find the remaining ones simply too soft and pasty-tasting? Yuck! Us too. This powder will guarantee you always have some of this precious wonder-food in supply. Blend into ice cream, smoothies, puddings or simply whisk up with vegan milks and hot chocolate drinks! Organic chewy banana coins made with 100% banana. Quantity : 2 bar x 40g/bag. 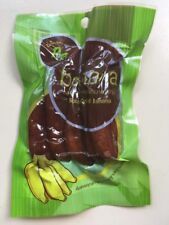 SweetGourmet Imported Unsweetened Banana Chips (Dried Fruit)-2LB FREE SHIPPING! However, an authorization will be placed on your card to ensure funds are available and may have an effect on your available balance. Net Weight: 2Lb. INGREDIENTS: BANANA, COCONUT OIL AND NATURAL FLAVORING. However, an authorization will be placed on your card to ensure funds are available and may have an effect on your available balance. Net Weight: 1Lb. INGREDIENTS: BANANA, COCONUT OIL, SUGAR, BANANA FLAVORING. Delicious Thai desserts recipe. - Thai fruit grade A. However, an authorization will be placed on your card to ensure funds are available and may have an effect on your available balance. Net Weight: 6Lb. INGREDIENTS: ORGANIC BANANAS, ORGANIC COCONUT OIL AND ORGANIC SUGAR.